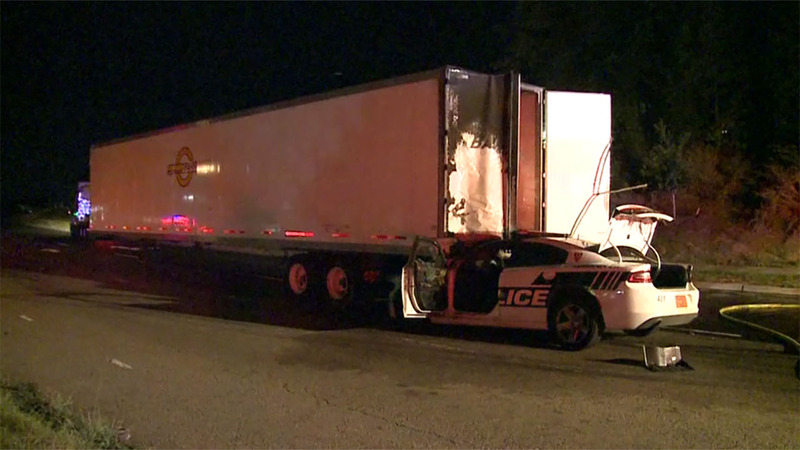 A Durham Police cruiser crashed into an 18-wheeler. DURHAM, North Carolina (WTVD) -- A Durham Police Department officer was involved in a vehicle crash at the intersection of TW Alexander Drive and S. Miami Boulevard shortly after 9:15 p.m. Friday night. The officer rear-ended a tractor-trailer, wedging his cruiser under the vehicle. The police vehicle caught fire. The officer, who suffered minor injuries, was responding to an armed robbery call at 300 Darby Creek Lane while running his lights and siren.